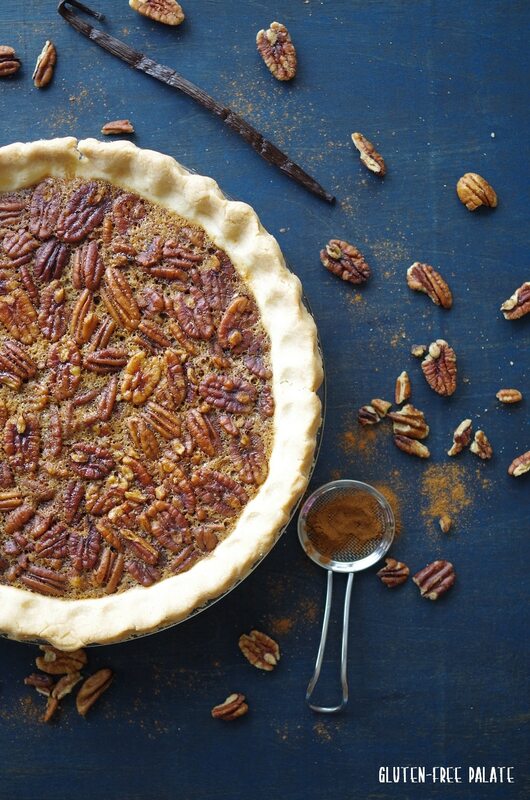 This classic gluten-free pecan pie comes together quickly with only a few simple ingredients. 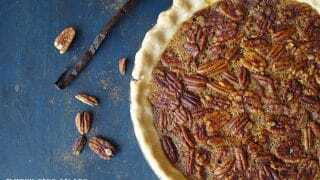 The flavors of maple and vanilla combined with pecans will have you running for a second helping of this gluten-free pecan pie. This incredibly delicious grain-free pecan pie is also dairy-free, and refined sugar free, making it a go-to gluten-free pie recipe year-round. There is an option for a traditional gluten-free pie recipe included for those that prefer one. 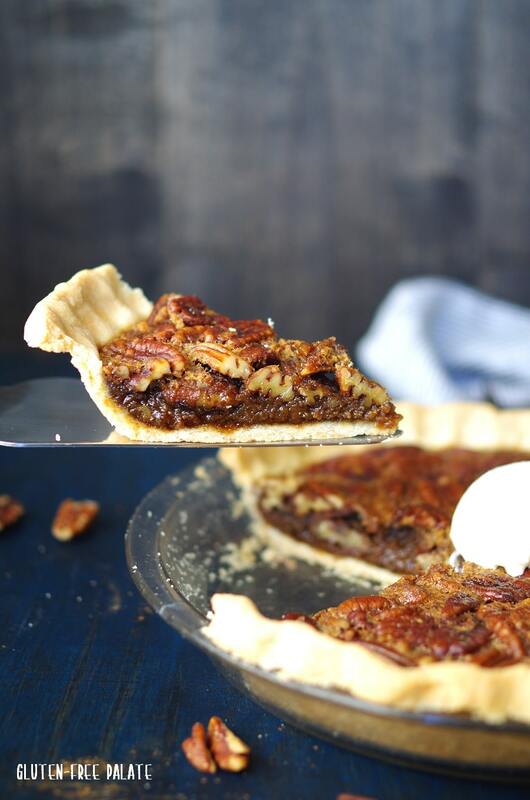 This grain-free pecan pie recipe is paleo friendly as-is with no substitutions and can be made the night before. 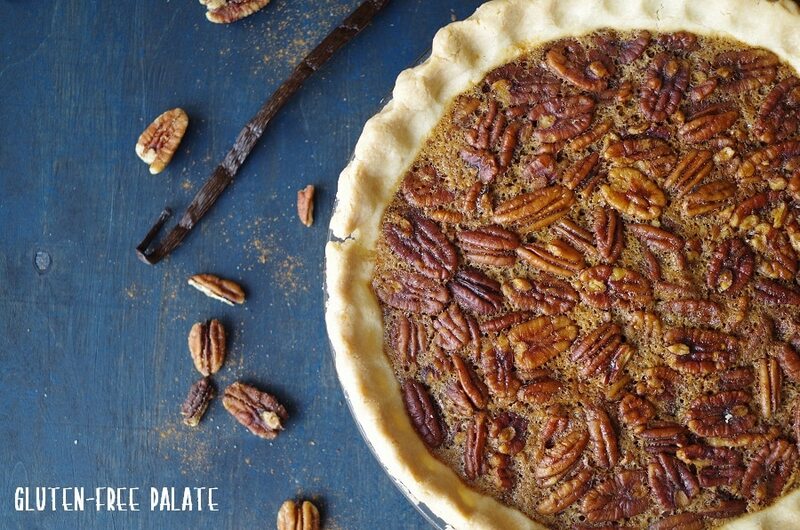 Gluten-Free Pecan Pie is a magical pie. More chemistry then magic but it’s magical the way that you can mix the right ingredients together and the pecans float to the top of the pie, while the center turns into a yummy thick filling. Can I use butter instead of coconut oil in gluten-free pecan pie? Yes, you can swap out the coconut oil for an equal amount of butter in this gluten-free pecan pie recipe. I’ve swapped the coconut oil for butter several times and it gives this gluten-free pecan pie a rich, buttery flavor. I haven’t tested this gluten-free pie with dairy-free butter. What other sweetener can I use besides coconut sugar in gluten-free pie? I would not recommend making the filling for this gluten-free pecan pie with a sugar free sweetener like stevia, or truvia. It won’t set up the way it needs to. You can substitute the 1 cup of coconut sugar with 3/4 cup white granulated sugar if you can’t do coconut sugar. 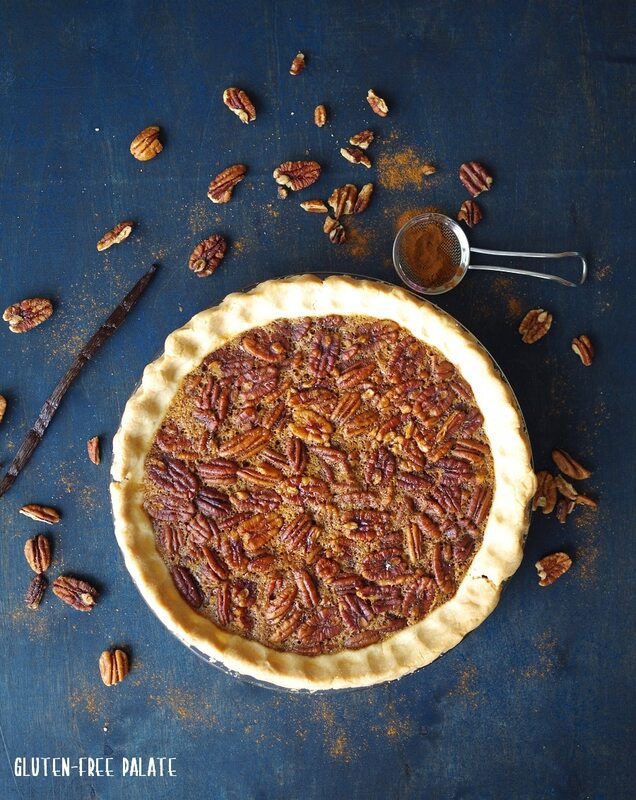 If you can’t have pecans you can always use walnuts or my favorite, hazelnuts, in this gluten-free pecan pie recipe. I’ve also used macadamias in a pinch before. The pie is still incredible. Just note, if you use walnuts this gluten-free pecan pie will be a little more acidic. Make sure to chop them before you add them to the filling. Make sure all ingredients are cold before you begin, unless otherwise noted. To help prevent a mess in the oven, place a baking sheet under the pie pan while it cooks. Let the gluten-free pie cool completely before slicing. Again, if you don’t want to use the grain-free pie crust or you can’t have nuts, you can use my traditional gluten-free pie crust recipe. In a medium mixing bowl, combine flour and starches, salt, and xanthan gum. To measure the flour, spoon the flour and starches into your measuring cup. Do not scoop the flour and starches with your measuring cup. With a pastry cutter, cut butter into flour mixture until the butter is small, no larger than the size of a pea. Add milk and combine. Use your hands to work the milk into the dough. Add additional milk if needed. Knead dough until it comes together. Form a ball with the dough. Place the dough ball onto a large piece of parchment paper and shape into a disc. Cover with a second piece of parchment and roll out into a 10-inch circle. Peel the top piece of parchment paper off, and invert into a greased pie pan. Flute the edges. Use your fingers to repair any tears in the crust, if needed. Bake the gluten-free pecan pie as directed in the recipe card below. Preheat oven to 350°F. Place a baking sheet on the rack in the center of oven. In a large mixing bowl, whisk the almond flour, tapioca starch, coconut flour, and salt. Add shortening and cut it into the flour using a pastry cutter until only pea sized chunks remain. Mix in the egg and water. Knead the dough with your hands to bring the dough together. Form a ball with the dough. Peel the top piece of parchment paper off, and invert the dough into a greased pie pan. Remove the second piece of parchment paper. Flute the edges. Use your fingers to repair any tears in the crust, if needed. For the filling, in a medium mixing bowl, mix coconut sugar, maple syrup, coconut oil, eggs, salt, and vanilla. Add pecans and stir just until combined. Pour filling into the prepared crust. The pecans will float to the top as the pie bakes. Place the pie on the baking sheet and bake for 45-55 minutes until the center is set and the pie doesn’t jiggle when shook. Cover the pie with foil halfway through to keep the edges of the crust from burning. Remove the pie from the oven and cool completely before cutting. If you are looking for more pie recipes, check out my gluten-free cherry pie and my gluten-free pumpkin pie. My friend Michelle at My Gluten-Free Kitchen has a lovely recipe for a Snickerdoodle Streusel Apple Pie. If you like coconut cream pie you’ll love this recipe by What the Fork Food Blog. Have questions about this recipe, or other recipes on my site? Leave a comment and I will get back to you. 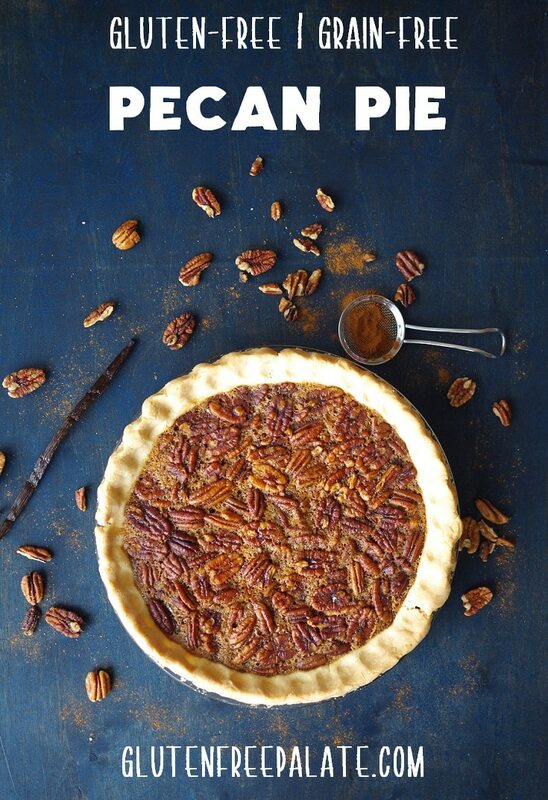 I love a good pecan pie recipe! Looks so delicious and perfect for Fall. I want to make this for my family.